You are here: Home / News / GIVEAWAY Announced! Win an Emeril Cookbook! GIVEAWAY Announced! 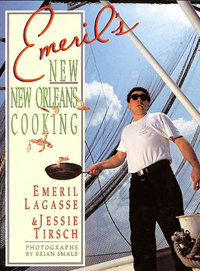 Win an Emeril Cookbook! The wonderful folks at Morrow Cookbooks sent me a whole bunch of books by Emeril Lagasse to thank me for participating in the One-Pot Blogging Party for his new cookbook, Sizzling Skillets and Other One-Pot Wonders. I already had a couple of them in my collection, so you know what that means … it’s GIVEAWAY time! To enter the giveaway: Comment on this post and tell me what New Orleans-style recipe you hope is in the book (e.g. Gumbo). Those of you on Twitter can increase your chances of winning by tweeting a link to this contest, including @diabeticFoodie in your tweet. Leave a comment here telling me that you’ve tweeted. Contest ends at midnight Eastern time on Thursday, November 10, 2011. The lucky winner, to be chosen randomly, will be announced on Friday, November 11, 2011. This contest is only open to U.S. residents. My favorite find would be Jambalaya. I have 2 favorites. I a good Crawfish Etouffee would be in the book but I would love to make Banana’s Foster again! Anything with pork fat! Seriously though, my mom is a huge Emeril fan and a diabetic, so she would probably want to see a light carb fish recipe, or one for an authentic oyster po’ boy. If I win, we’ll have a good time experimenting in the kitchen together. I hope to find a recipe for Jambalaya there.